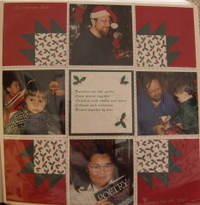 I used to be a scrapbooking maniac. I compiled, cropped, and journaled thousands of photos into big, bulky photo albums. After I started taking digital pictures and blogging, I found myself doing less and less scrapbooking. I started just using my photos for blog posts and occasionally printing them out when my mom whined loud enough about never getting to see her grandson growing up. Other than that, my photos are just hanging out on my harddrive. Yesterday, my friends at the Silicon Valley Moms Blog invited me to an event sponsored by HP at a nearby Long's Drugstore to make a photo poster. To be honest, I wasn't expecting much, but Techmama's very brave husband offered free babysitting for my son and her three boys, so we ventured over together. I had uploaded some of my favorite photos of our trip to Greenland last year onto a flash drive, and thought I would make something for Alex's room. They offered us a free poster for mombloggers and friends, so I had nothing to lose. Plus, I needed some shampoo, so going to the drugstore was on my list of errands for the day anyway. We were greeted by a number of friendly reps from HP, who were standing by a photo machine kiosk, ready to help us turn our pictures into a 16x20 poster. Beth went first, and it took her about 10 minutes to load in the pictures, choose a background color, and shuffle her photos into a pattern that she liked. It took another 15 minutes or so to print out, and the quality was pretty amazing. The photo collage was printed out on heavy, photo-quality paper with a matte finish and looked very professional. I had a little technical difficulty with mine, because the Sandisk flashdrive I won from Socal Mom's giveaway last week was new and contained some kind of software that the machine couldn't read. They ended up making a CD for me on another machine, and when that didn't work, they loaded my pictures onto another flashdrive and we were good to go. They HP reps said this glitch will be fixed with a software upgrade soon, and that the machines should be able to read any of the newer flashdrives in the future. For now, it's best to take in a CD, an older flashdrive, or any memory card from your camera to make a poster. After we got the pictures uploaded, the touchscreen led me through a series of easy steps of choosing photos, cropping them, choosing a color background, and then a series of "shuffles" that put the pictures in various places in a collage format. You can't choose the exact placement of your photos, which is either a blessing or a curse, depending on how you look at it. I could imaging myself spending hours standing in front of the machine, changing sizes, moving pictures around, and not being able to decide how to format the thing. With the shuffle, the software makes the decisions for you, and you can hit the shuffle button as long as you want to, until you get the right configuration. I think I went through about a dozen different variations before I hit on two or three I really liked. I loved how easy it was to use the machine, and the quality of the end product. I ended up buying a frame and hanging it in the living room, instead of pinning it up in Alex's room as I had planned. I could definitely see making something like this for a teacher gift, a grandparent gift, or to commemorate a very special event. The machine also makes lovely calendars, photobooks, and greeting cards. To find a location of one of the HP photo machines near you, click here. 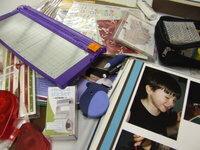 I spent yesterday at a scrapbooking event called "Memoranza" hosted by my friend Liesbeth and a half dozen other Creative Memories consultants. I was a little embarassed to note that the album I was working on was the same one I was working on at last year's event. I was a little surprised to look inside and think, "I'm pretty good at this! Why did I stop doing it? Oh right, the blog..."
I was sitting with my friends Claudia, Debbie, and Jean, who I see a couple of times a year at these events. They are the main reason that I go, since not a lot of scrapping goes on in this house. Three of us are former Creative Memories Consultants and like to compare the new products to the old days, when things were far, far simpler. We're like a crew of little old ladies reminiscing about how much acid we took at Woodstock. "Remember those really, really long stickers? What were they called?" Blank stares all around. Claudia told me that the other day her husband Bob came in and announced, "There's something I need you to explain to me. What the heck is a blog?" Bob and Claudia are retirees who have between them a total of nine grown-up children. They live in a retirement community, and are pretty computer-savvy (my parents, on the other hand, don't own a computer). Claudia calmly explained to Bob that a blog is a personal website where people write about what is happening in their lives. "I don't get it. Why would anyone want to do that?" said Bob. "Can't they just send an e-mail?" Claudia took Bob to the computer, and showed him two blogs that she reads. One is for Project Linus, a group that makes blankets for children that she volunteers with, and the other was mine. "Doesn't Glennia have a small kid? When does she have time to write all this stuff?" Bob asked. "I don't know," said Claudia. "Maybe the hours between midnight and six am aren't taken." "Glennia writes a lot of stuff here. Who reads all that?" She showed Bob the NeoWorx Counter at the bottom of the page. "Apparently, thousands of people from 82 countries," She replied. Bob was still scratching his head at the end of the exchange, but at least one more person now knows what a blog is. It's only a matter of time before Bob starts to chronicle his adventures on the landscaping committee and Claudia's mahjong victories at BobandClaudia.com. Hi, I'm Glennia, and I'm a scrap-aholic. It all started innocently enough. A friend invited me over to her friend's house for a party. "It'll be fun," she said. "You don't have to do anything you don't want to. I'll even pay for you this time." I figured, "What could be the harm? A few hours with some nice women chatting and putting our photos into albums. How could that hurt?" I was so innocent back then. So carefree and naive. I resisted at first. I didn't have a lot of money to spare on hobbies since we'd just bought a new house. I made up excuses. "I'm not that kind of person..." I told my friend, "you know, the crafty kind. I'm not artistic at all." "No worries," said the chipper dealer Consultant, "Anyone can do it. Come on, what are you afraid of? It's fun. I think you'll like it." I started thinking about my adorable little nephew, born only a few months earlier. I knew his mom was too tired to make a baby album for him. I rationalized that it was my duty as Aunt to do it, right? I mean, how else was that kid going to grow up knowing what his first bath was like? Or his first tooth? Or when he was potty trained? My mom always says, "No pictures, no memories" like she gearing up for the North Koreans to brainwash her and steal her memories. I was weak and I caved to the peer pressure. I drank the paper-cutting, photo-cropping Kool-aid. Initially, I bought the small sized album and the smallest kit they had and timidly took it home. I stayed up all night finishing my project, using all the pictures we had taken of my nephew the day he was born, the ones my brother sent me, and some from my mom. It was cool. It was relaxing. It was a rush. Everyone I showed it to oohed and ahhed like I'd just recreated the Sistine Chapel using silly putty and sidewalk chalk. I liked feeling crafty. After the success of my first project, I found more and more things to scrapbook. Our honeymoon trip around the world. My mom's life story for her 60th birthday. I spent 2 days and nights before my mother-in-law's funeral making a tribute album to honor her life. Good times and bad. Scrapbooking became an emotional outlet and a kind of creative high for me. At first, I did it out in the open, in front of my husband. He got tired of the mess on the dining room table, so I took it on the road and met up with different scrapbookers at their houses. We held clandestine meetings called "crops" all over the Bay Area. My husband called it "The Cult". I drove from Palo Alto to Fremont to Los Gatos to San Bruno to meet in dining rooms, garages and basements with other fanatics. Some of the women even had their own separate cropping studios. This was the equivalent of having your own crystal meth lab in your garage. I went to an annual Croptoberfest that was held at a local card club. Walking past bleary-eyed black jack players, I recognized that look in their eyes, the one that said, "Just one more hand..."
We scrappers said, "Just one more page...I'll be done in just one more page..." as we cut and pasted photos of our kids into top-quality strap-hinge bound albums into the wee hours of the night. One woman told me that she was looking at a friend's photo album and she found a little cellophane bag inside containing a brownish dot. When she asked what it was, the friend replied, "My baby's first booger!" We were pretty far gone, but not that far. Creating all these scrapbooks meant buying more product. My husband started questioning me. "Who is this Judy that you keep writing checks to?" he asked. I pretended it was a new hairdresser and not my Creative Memories Consultant. He eyed my haircut suspiciously. I started paying in cash so he wouldn't catch on to how much I was spending. Eventually, I signed up to be a consultant so I could get the product wholesale. That's how bad it got. I was no longer just an addict, now I was a dealer, the scum that gets everyone else hooked. I didn't care, as long as I had my daily fix of adorable acid-free bunny stickers, scalloped-edged scissors, and heart-shaped paper punchers. Acid-free, lignan-free, archival-quality. These three became my Trinity. I worshipped at their altar. Then, we had a baby, and my addiction grew worse as he got cuter. I reasoned that if I didn't make a two-page spread of his every waking moment, Baby Alexander would think we didn't love him. I mean, all the other cool moms were doing it. I secretly wished I was a Mormon, so I could move to Utah, the Scrapbooking Capital of the World. Eventually, I scrapped about 2,000 photos, but didn't make a dent in the 11 million in shoeboxes and archival quality bins full of photos, under the bed, in the closet. The more I scrapbooked, the more pictures I took. It was a vicious cycle. I finally hit bottom when I realized I had a complete album of my son's second birthday party. A whole 30 page album, people! The Elmo theme of the party running through like a not-so-subtle leitmotif of furry red monsters. 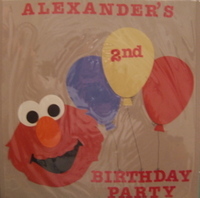 I confess, I set up the party with the idea that "this would make a cute page..." and forced his little friends to line up so I could have a cute page topper that said, "Elmo's Friends" on it. I cut out Elmo's head freehand and punched huge white and black circles for his eyes. Not just a couple of pages, an entire book of every child, every adult, every blade of grass in the park that day. I soon realized that we would be taking Alex to college with a duffel bag full of Old Navy clothes and U-Haul full of scrapbooks memorializing his every waking hour on the planet. I realized then that I needed to back away from the die cuts and get a life. I quit being a dealer. I sold all my excess supplies at a fraction of the cost. I hung up my paper punchers and put away my chalking pad. I took a break. I'm now what you might call a "recreational scrapbooker." I only do it once in a while, mainly to see my other addict friends and socialize. I'm not completely cured, because my damn kid just keeps getting cuter and demanding that I photograph all that cuteness. So, I think I've gotten it under control, and am taking things one day at time. I asked my Higher Power for strength to accept the things I cannot change (the fact that I probably won't live long enough to scrapbook all the photos I have) and change the things I cannot accept (the fact that I really don't need another tin of chartreuse metal eyelets, no matter how cheap they are). I am working on the serenity part. 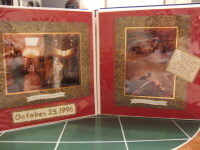 Just about the time I decided to go cold turkey on the scrapbooking, I discovered blogging. Given the amount of time I've spent online lately, I'm beginning to think that scrapbooking is the gateway drug to blogging.